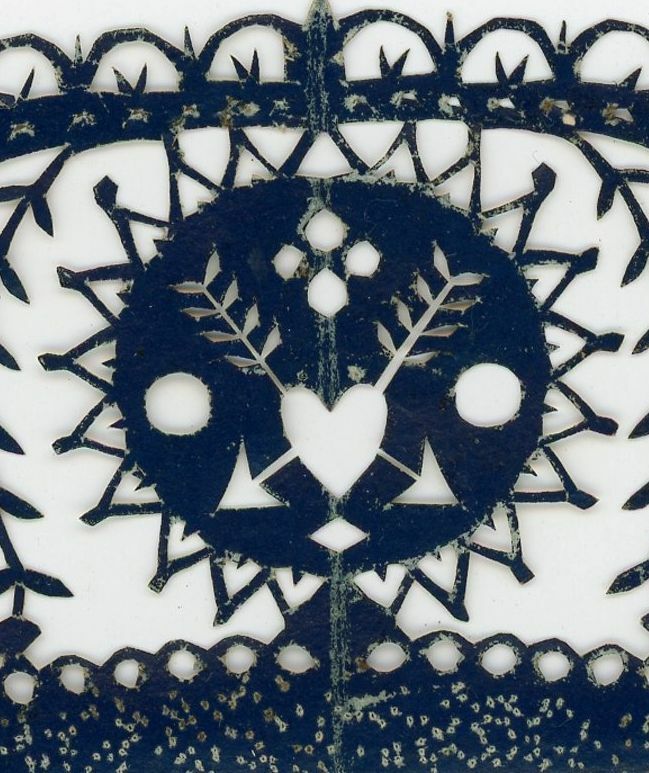 This is a wonderful example of a scissor cut, also known as a decoupage (from the French) or a scherenschnitte (from the German). 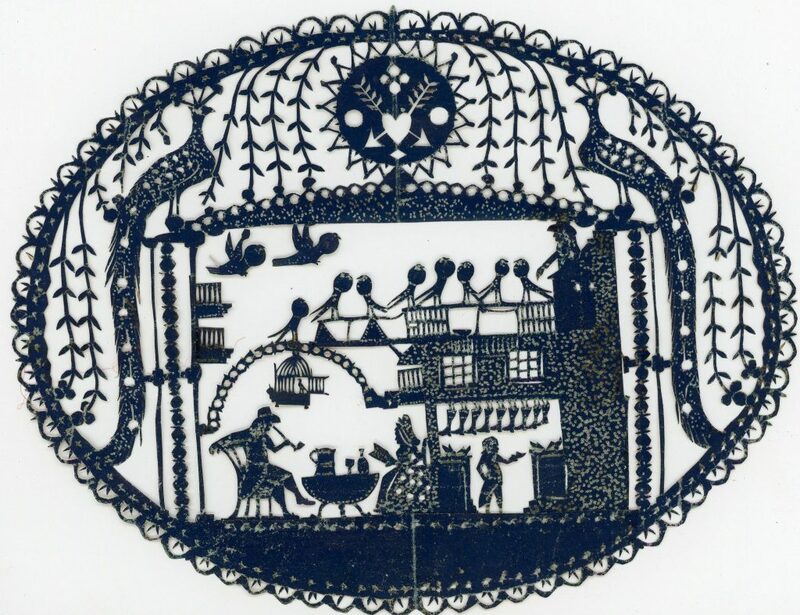 The art of paper cutting was particularly popular in continental Europe with Marie Antoinette known to have tried her hand. It was also a fashionable pastime at the Court of King George III whose daughter Princess Elizabeth was an ardent cutter. 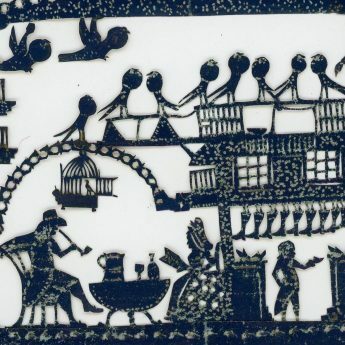 Her album of delicately cut scenes illustrating the poem “The Birth & Triumph of Cupid” remains in the Royal Collections. 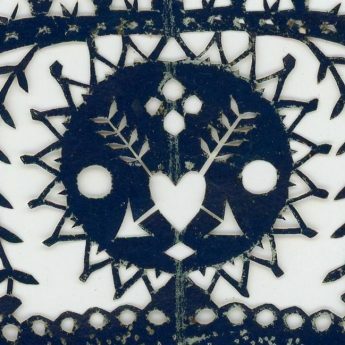 Dating from the late 18th or very early 19th century, this fine example portrays a series of mini tableaux set within a delicate lace-like cut border with trailing leaves and presided over by a pair of ostentatious peacocks on either side of a symbolic heart pierced by arrows. 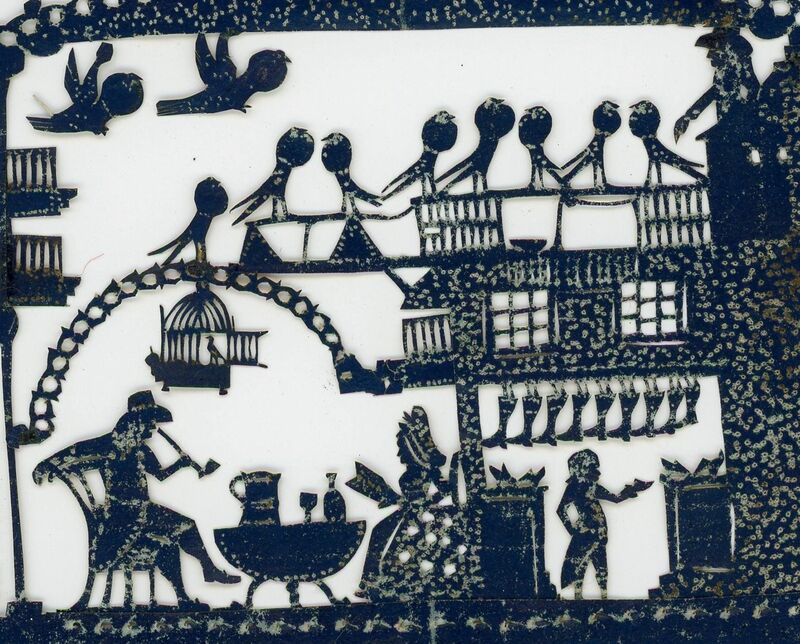 The central area features a delightful domestic scene with a couple seated at a table: the gentleman lounging on his chair and smoking a long pipe with a huge flagon of beer to hand; and, his wife sitting opposite him contentedly reading a book and enjoying a glass (or two) of wine. Overhead, swinging on a trellised arch, sings a bird in a cage. Alongside is a more industrious scene where a young boy is busy polishing the family’s many shoes and boots whilst up on the next level a behatted young gentleman (the son and heir perhaps?) stands on a balcony feeding a flock of plump lovebirds. 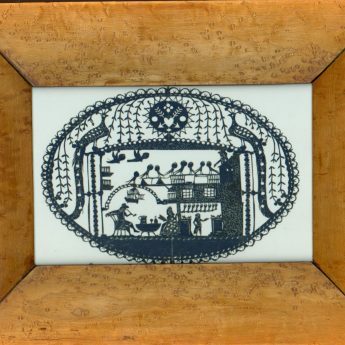 The picture is cut from paper that is black on one side only; the paper has also been pricked with a pin in places to add texture and definition. 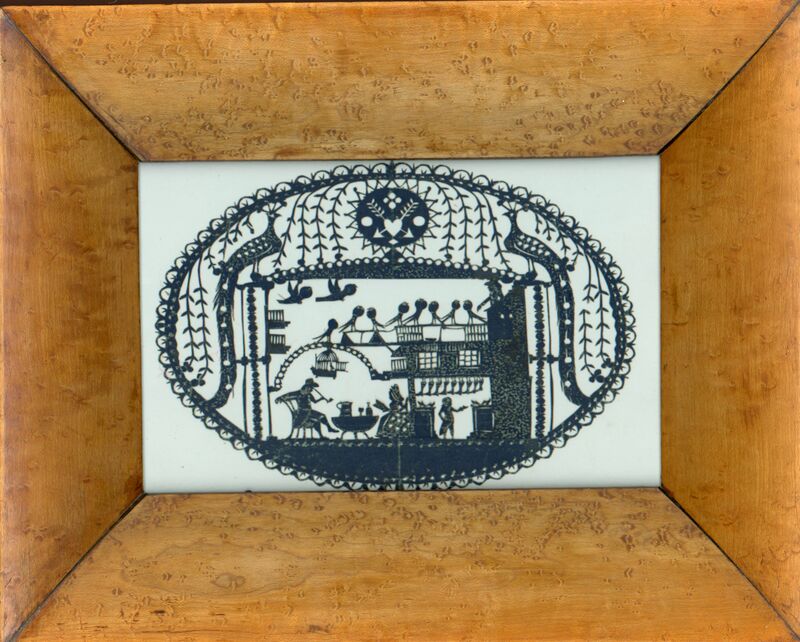 It has been loosely laid against white conservation paper to achieve an effective contrast (it is not pasted down) and is securely housed in a handsome period bird’s eye maple frame. Sadly there is no clue as to who created this piece or where. It is said to have been discovered amongst the personal papers of Irish novelist and socialite, Sydney, Lady Morgan (1776-1859). 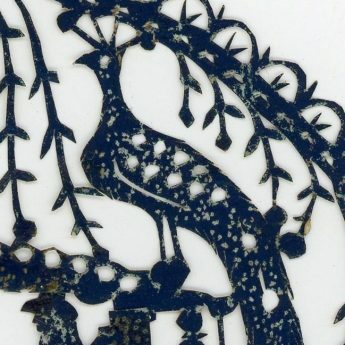 Given its age and its delicacy, the cut paper is in remarkable condition with only a couple of small breaks, the most noticeable of these being to one of the trailing branches on the right. One of the hanging lovebirds is also detached but has now been repositioned. A light vertical crease visible top and bottom shows where the cutter folded the paper originally to achieve perfect symmetry.